Author of The Big Music, an award-winning novel of fragments, history, and music, along with many other prize-winning novels, essays, and short stories, Kirsty Gunn is a writer entirely attuned to the richness and responsibilities of fiction. Her work looks back at its own making, drawing attention to the artifices and (more importantly) the truths, that constitute the very core of storytelling. 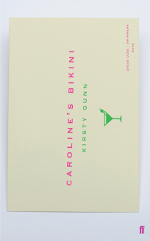 Her latest novel, Caroline’s Bikini, is the story of a love story. When Evan and Caroline meet, he asks his friend Emily to record their falling-in-love. Their shared literary project is fuelled by G&Ts, Q&As, and a swirling cocktail of infatuation and imagination. At once charismatic, playful, and thoughtful, this is a novel that, like a swimming pool on a summers day, entices us into the deep-end.